Yards from the beach, in an elevated location, this charming Victorian ground floor conversion has stunning views across the bay towards the harbour, with miles of golden sands to 3 golf courses, various water sports and other leisure pursuits.The house is fully refurbished and well equipped to a high standard providing a high level of comfort for guests who return regularly. Elie, situated in the delightful East Neuk of Fife has miles of golden sands, 3 golf courses, various water sports, tennis courts, beautiful coastal walks and many other leisure pursuits. Historic St Andrews, the home of golf and packed with interesting shops and restaurants, is a 15 minute drive away. Nearby, quaint coastal fishing villages offer boat trips along the coastline and an abundance of art and craft galleries that line the cobbled lanes and wends. The property is based on the ground floor with a spacious lounge with two leather sofas scattered with throws and cushions, a designer coffee table, well stocked book shelf, digital HD TV and DVD, polished hardwood floor, open fire and large bay window with a window seat overlooking the harbour and beach. There is a private driveway for parking and terraced garden overlooking the beach and harbour, with BBQ and garden furniture. This is a great place for dinning, sun bathing or watching the world go by. Unlimited Wi-Fi is also available. There are 3 bedrooms - 1 double (5ft. king size bed) with French doors and views across Elie Bay; 1 twin ,1 with 3ft. bunk beds. The dining kitchen is fully fitted with white 'Shaker' style units with beech worktops, beech flooring, Neff double oven, hob, microwave, dishwasher, fridge and freezer . There are wonderful views from the circular glass dinning table through to the conservatory, leading from the kitchen which is a beautiful, bright sunny room with views over the bay. There is a utility room with washing machine and tumble drier. The Italian tiled bathroom has a Victorian tub bath, corner power shower, bidet, toilet and basin and there is also a separate toilet with basin. The property has a spacious hall and vestibule with interesting original art work throughout. It is freshly painted in pale seaside colours to reflect the natural hues of the sea and sky. Luxury bathroom with white Victorian bath tub and corner power shower. Separate toilet with basin. Italian floor tiles. A weekly linen, towel change and house clean. Basket of logs provided, further supplies available locally. Guests can enjoy collecting drift wood on the beach. Dine either in kitchen or in the Bay Window of the lounge, both areas over look the beach. You can enjoy romantic meals whilst watching the tide come and go. There is a large stock of adult books and a selction of jigsaws and board games. Water Sports Centre 5 minutes walk from the house with full facilities and gear. Local charges apply. There are a few steps from the garden up to the front door of the property. Once inside the property is perfect for elderly or infirm guests as the views from the house are amazing and the window seat or the garden terrace are both perfect places for relaxing. Unlimited Wi-Fi is available and many guests have found Dalmore to be a creative place for writing or painting. We have stayed at this property often which speaks volumes for the property. We have always found it to be spotless on arrival and very well maintained. The owners are very welcoming and anytime there has been an issue (always small) it has been dealt with immediately. The local pub is only a hundred yards away with a lovely restaurant and a welcoming bar. We loved the villa with its wonderful views. All of us spent a very comfortable weekend there. The property was clean, cosy and very comfortable. The property was perfect for a chilled weekend with old friends. We enjoyed cooking, relaxing in front of the open fire and long walks on the nearby beach. It was lovely being so close to The Ship Inn for a pre dinner drink. All round a fab weekend made most special by this warm relaxing home from home. I absolutely love this beautiful house, it is so inviting, from the big breakfasting kitchen to the bedroom looking on to the sea. It is great as a family get together house. Long beach walks and cosy suppers afterwards. Everything you could want from a seaside home. We had a lovely week in Elie staying at Dalmore. The property is very homely and a great location for the beach and chilling out! Golf Courses: There are 43 golf courses in Fife, including 6 at St Andrews, the home of golf, just 15 miles to the North Elie water sports windsurfing, canoeing, sailing, pedaloes, boat trips, inflatable rides, water skiing, mountain bikes places to eat. 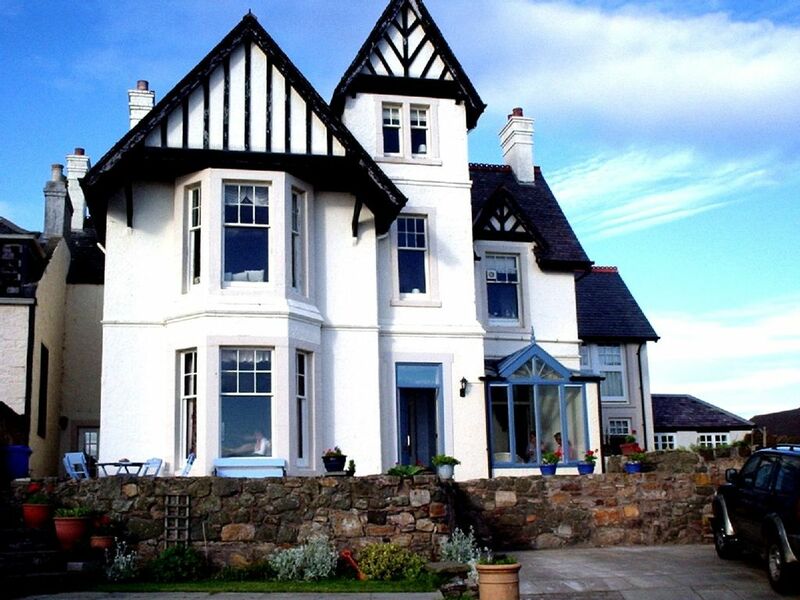 There are a wide selection of coffee shops, bars and restaurants in Elie. A few of our favourites are: Ship Inn only 50m walk from the accommodation, the Ship Inn is a family friendly environment, offering healthy portions of home made food. The Pavillion beside Elie Sports Club, a 5 minute walk, simple home cooked and good value, breakfasts, lunch, dinner and all day snacks including delicious home bakes. Golf: FIFE can offer you some of the finest golf courses in Scotland, if not the world. It would be difficult to find a town or village in Fife that does not have a golf course. Elie, boasts 2 golf courses, a 9 hole and an 18 hole. The golf here is in keeping with the holiday atmosphere where enjoyment is the main priority. The real character of the golf course is a stretch that takes golfers out to the sea and, with a wind off the Firth of Forth, leaves one in no doubt as to its seaside character. The Old Course St Andrews 20 minutes drive away is traditionally known as the most famous golf club in the world and has hosted the Open Golf Championship on many occasions. A few miles away you will discover a selection of other delightful Fife golf courses well worth considering such as Ladybank, Crail and Leven Links. Rates are fully inclusive of all bed linen, towels, gas, electricity and WiFi. Guests are welcome from 4.00pm on arrival date and requested to vacate the property by 10.00am on departure date. Please contact the owner for price on short breaks. We look forward to welcoming you.